(P2) At the beginning of his ENCYCLICAL on climate change that will SHAKE UP environmental politics around the world, this is how Pope Francis describes St. Francis of Assisi, the saint who INSPIRED the name he chose. (P5) There is no AMBIGUITY in what the pope is saying, which is why the critics will DESCEND UPON him. Even before Thursday’s formal release of the document, they accused him of MEDDLING in political and scientific questions that are beyond his PURVIEW. (P6) This CRITIQUE is coming especially from conservatives who have welcomed the INTERVENTION of the Catholic Church on some political issues but not others, and particularly not this one. Yet progressives and conservatives alike should ATTEND TO what MOTIVATES Pope Francis here — not the usual left-right politics but a THEOLOGICAL concern for our OBLIGATION to care for our “common home,” a SKEPTICISM of a “THROWAWAY culture,” and an insistence that a belief in God means that human beings cannot put themselves at the center of the universe. (P7) “We are not God,” the pope declares, and should not act as if we are “USURPING the place of God, even to the point of claiming an unlimited right to TRAMPLE his creation UNDERFOOT.” Believers who disagree with the pope will have to GRAPPLE with his religious understanding and not simply DISMISS his EMBRACE of a thoroughly ORTHODOX view that places the spiritual and the ETHICAL ahead of the material. (P9) Yet any who claim that Francis is ignoring the Catholic past and inventing RADICAL new DOCTRINES will have to RECKON with the care he takes in paying HOMAGE to his PREDECESSORS, particularly Pope Benedict XVI and St. John Paul II. He CITES them over and over on the limits of markets and the URGENCY of environmental STEWARDSHIP. “Laudato Si (Praised Be)” is thus thoroughly consistent with more than a century of modern Catholic social teaching, and if it BREAKS NEW GROUND, it does so within the CONTEXT of a long tradition — going back to St. Francis himself. (P10) Pope Francis POSES a challenge to those of us in the wealthy nations, and he speaks SPECIFICALLY about how “opinion makers, communications media and centres of power are far removed from the poor.” Ouch! He demands payment of an “ECOLOGICAL debt” between “north and south.” Again and again, he returns to the twin ideas that the world’s poor face the largest threat from climate change and that the world’s rich have a special obligation to deal with it. The pope who IMMERSED himself in the most MARGINALIZED neighborhoods of Buenos Aires has not forgotten where he came from. (P11) But if Francis is making himself the Green Pope, it’s not just because he has a social AGENDA. Like his NAMESAKE saint, he believes in the TRANSFORMATIVE power of simplicity and COMPASSION. “We must,” he writes, “REGAIN the CONVICTION that we need one another, that we have a shared responsibility for others and the world, and that being good and decent are worth it.” This is precisely where the personal and the political must meet. Do you have personal concerns about climate change? Or do you think other problems are more important? Why will Pope Francis’s new encyclical be CONTROVERSIAL? Pope Francis is often described as a “VISIONARY leader,” as Steve Jobs and some other business leaders have been described. What does it mean to be a visionary leader? 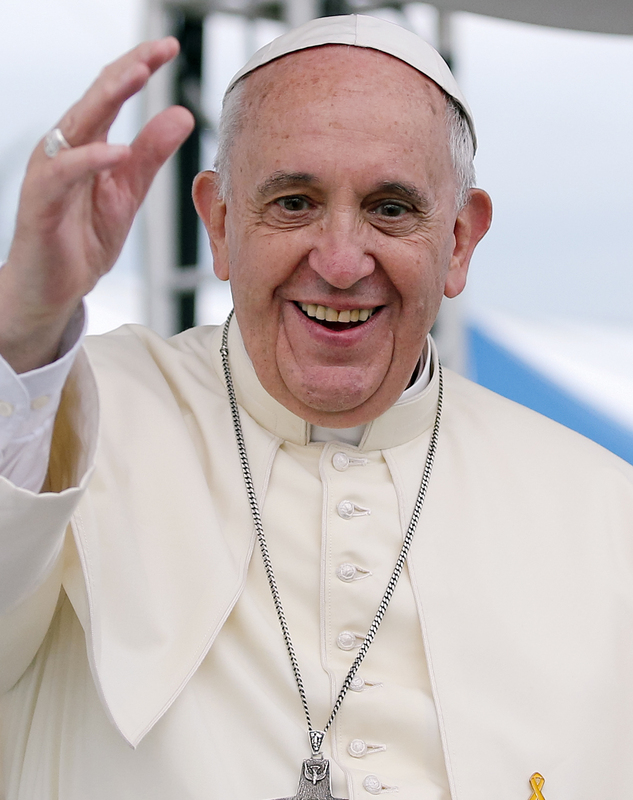 Is Pope Francis only RELEVANT to Catholics, or do you think that he has a broader INFLUENCE?